The Phantom of The Opera slot from Netent is based on the 1920’s silent horror movie produced by the original Universal Studios motion picture company. The Swedish developer has created an audio and visual spectical, with slick graphics and animations and a variety of nerve jangling sound effects. The reels are transparent and sit over the tiers and balconies of the deserted Opera House, waiting for foul deeds to be done and the Phantom will not let you down, I can assure you of that! Surprisingly this theme hasn't been covered much by developers, the nearest we get in Europe is Phantom Cash my Microgaming, although their is an Internationally accessible RTG slot simply titled Phantom of The Opera. Will you be able to safeguard your bankroll against this knife-wielding fiend? We start with a grid of 5 reels and 4 rows over which there are 40 paying lines, and the first thing to mention is that they pay both right-to-left as well as the usual left-to-right. The Phantom's Mask forms the Wild and can appear stacked but only matches the best paying symbol, the Phantom himself, at 10x bet for 5-of-a-kind. You only need to pay 20 coins and you will get 5x that amount for the Lady which like all the other symbols will appear stacked. The remainder are the Gold Ring at 3x bet, Yellow Rose at 2.5x with the Mirror or Dagger paying 2 for a full line. The card values are represented pictorially and all award a simple 1x for a full line. 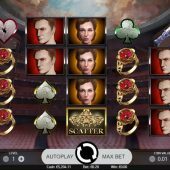 Chandelier scatters appear on reels 1, 3 and 5 to trigger your bonus round, but firstly we should consider some odd goings-on with the Wilds combined with the Phantom and Lady of the Opera characters. There is a double-stacked Phantom which can appear on reel 1 and on reel 5 there is a double Lady and double mask Wild. If you land the double Phantom on reel one and the double Wild on reel 5 then a re-spin is awarded. The triggering icons remain as sticky Wilds along with any Phantom icons that may have landed on the centre 3 reels which also turn to sticky Wilds. You get a respin, and hopefully a decent win. In the base game all three of these icons, the Phantom, Lady and Wild can combine with each other to form wins in any permutation awarding the same pays as the Phantom icon when they do. The second in-play event is again the double Phantom on reel 1 but this time with the double Lady on reel 5. You will be taken to a sad-looking Lady in a yellow dress who reveals 8 pink roses. You choose these for small amounts of up to 5x bet each until you hit the 'X'. You then see her 3 mirrors and pick one for a 1, 2 or 3x multiplier on your collected coins. The most you can win is 36x bet (720 coins) or 7200 coins if you are playing the full 10 coins per line. Triggered by 3 Chandelier scatters on the odd reels, you then get unlimited free games. There are more stacked mask Wilds it seems, but beware! Should a single mask Wild appear in view, the Phantom behind the mask will reach out and slash one of the 5 ropes holding up the heavy Chandelier. Unfortunately you can get 2 or 3 in one spin and your bonus round is quite literally hanging by the proverbial thread! When the 5 ropes are cut, so is your bonus.